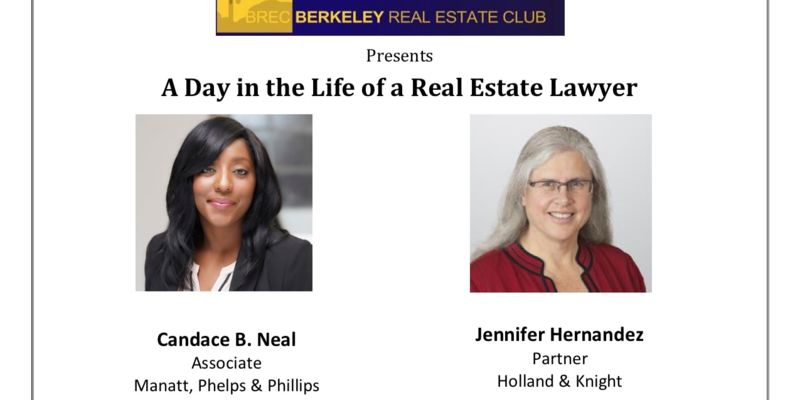 Please join the Berkeley Real Estate Club for a lunch talk that explores a day in the life of a real estate lawyer in both transactional and land use specialties on Monday, April 15. We welcome Jennifer Hernandez of Holland & Knight, and Candace B. Neal of Manatt, Phelps & Phillips. Ms. Hernandez is a recognized expert on land use law, environmental law, and California Environmental Quality Act reform. Ms. Neal is an associate specializing in real estate transactions, including acquisitions and dispositions, development, joint ventures, and secured loans. Food will be provided on a first come, first serve basis. Jennifer L. Hernandez leads the West Coast Land Use and Environmental Group. She divides her time between the San Francisco and Los Angeles offices, and works on projects in Northern and Southern California, as well as the Central Valley. She has achieved national prominence in her work on brownfields redevelopment, wetlands and endangered species, as well as the California Environmental Quality Act (CEQA). She represents a broad variety of private, nonprofit and public sector clients, including real estate developers, public agencies and operating companies in numerous industries. Candace Neal is a Manatt Real Estate associate in the firm’s San Francisco office. She focuses her practice on real estate transactions, including acquisitions and dispositions, development, joint ventures, and secured loans. Before joining Manatt, Candace worked as a real estate associate for an Oakland-based law firm, where she handled transactional matters related to commercial real estate, including drafting purchase and sales agreements and leasing transaction documents. She has several years’ experience in handling residential real estate transactions as well as in issues related to land use and zoning.